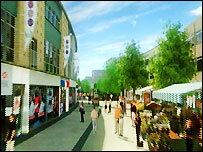 The full new name of the £500m expansion of Broadmead shopping centre has been unveiled as Cabot Circus. Cabot was chosen as the official name after a public vote was held in November. Other names considered were All Saints and Great West. Some groups had complained the first suggested name, Merchants' Quarter, was offensive because of its connotations with the city's slave trading past. Bristol Alliance, which is behind the project, chose to add Circus. Other suffixes considered were Quarter, Court and Square. Rob Graham, Bristol Alliance marketing manager, said: "We were looking for an identity that reflects the bustle and vibrancy of a thriving city centre. "Cabot Circus allows us to do this - whilst creating a focus for the area and a destination for visitors to the city." He said Circus was chosen as a suffix because it is more exciting than the other choices and that a circus is a pivotal place where people gather which is what the new shopping centre will be. It would have been easy to have simply changed Merchants to Cabot and stick with Quarter, he said, but they wanted to create something exciting. A poll on the BBC's Where I Live website revealed 63% of voters wanted the name Cabot. John Cabot was a 15th Century Italian explorer, also known as Giovanni Caboto, who moved to England and settled in Bristol, from where he set off on many of his epic voyages.